What kinds of moral challenges arise from encounters between species in laboratory science? 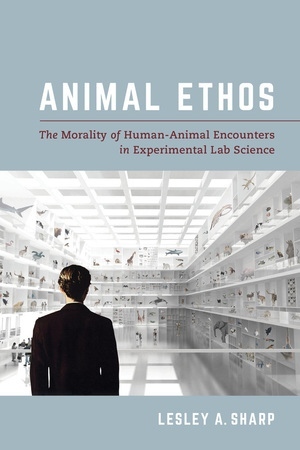 Animal Ethos draws on ethnographic engagement with academic labs in which experimental research involving nonhuman species provokes difficult questions involving life and death, scientific progress, and other competing quandaries. Whereas much has been written on core bioethical values that inform regulated behavior in labs, Lesley A. Sharp reveals the importance of attending to lab personnel’s quotidian and unscripted responses to animals. Animal Ethos exposes the rich—yet poorly understood—moral dimensions of daily lab life, where serendipitous, creative, and unorthodox responses are evidence of concerted efforts by researchers, animal technicians, veterinarians, and animal activists to transform animal laboratories into moral scientific worlds. Contract Labor and Lab Animal Care: Who Profits? Who Suffers? Lesley A. Sharp is the Barbara Chamberlain & Helen Chamberlain Josefsberg ’30 Professor of Anthropology at Barnard College, Senior Research Scientist in Sociomedical Sciences at Mailman School of Public Health at Columbia University, and Fellow at the Center for Animals and Public Policy of the Cummings School of Veterinary Medicine of Tufts University. She is the author of several books, including theThe Transplant Imaginary: Mechanical Hearts, Animal Parts, and Moral Thinking in Highly Experimental Science; and Strange Harvest: Organ Transplants, Denatured Bodies, and the Transformed Self, which won the Society for Medical Anthropology’s New Millennium Book Award. 2. Why Do Monkeys Watch TV?